Between the central and The eastern bastions, In the upper part of the wall two long slanting interrapted ledges with trees make the big slanting corner, well seen from the road, named Triangle. The middle part of the route goes along the left ledge, forming the Triangle. On the section R1-R2 firstly go 20 m upwards by the vertical corner or by its left wall. Then move 20 m upwards by the wall to the left from the corner and go 10 m upwards and to the left to the next corner ( 30 m, 80 0, IV+ 20 m, 70 0, III). On the section R2-R3 firstly go upwards and to the right by the corner and then go by the wall till the long inclined ledge – the left side of the Triangle ( R2-R3: 50 m, 75 0, III). On the section R3-R4 there is a 100 m long traverse upwards and to the right by the inclined ledge to the beginning of the wide corner ( R3-R4: 100 m, 60-70 0, II - III). On the section R4-R5 go 40 m upwards by the wide corner and its left side to the base of the vertical corner ( R4 - R5: 40 m, 75 0, IV). The ascent takes 3 - 4 hours. Length of the main part of the route is 270 m.
Between the central and The eastern bastions, In the upper part of the wall two long slanting interrapted ledges with trees make the big slanting corner, well seen from the road, named Triangle. Under these ledges there is an abrupt wall. In its center there is a well seen group of trees on the terrace. The route passes through the center wall to this group of trees, then go upwards and to the left to the long ledge, making the left side of the Triangle. From the upper road, 30 m to the east from the fork to the lower (the main) road and village Foros, ascend firstly by the path, then by the slide-rocks and easy rocks to the inclined terrace overgrown with bushes and trees, situated under the “Triangle”. Go along it under the central part of the wall (R0: 200 m, 30-50 0, б/ к-I). On the section R1-R2 - go 100 m upwards by the cracks and corners of the wall to the right part of the terrace with trees, situated in the middle part of the wall. Overhanging walls on the second pitch can be bypassed on the right (R1-R2: 100 m, 65-70 0, III+). On the section R2-R3 go firstly 30 m by the terrace to its left edge. Then go upwards and to the left 50 m by the abrupt destroyed crack to the tree on the long ledge – the left side of the Triangle. ( R2-R3: 30 m, 50 0, I 50 m, 75-60 0, IV - III). Then the route coincides with the route №8. On the section R3-R4 – go upwards and to the right by the slanting ledge to the wide corner (R3-R4: 50 m, 60-70 0, II-III). 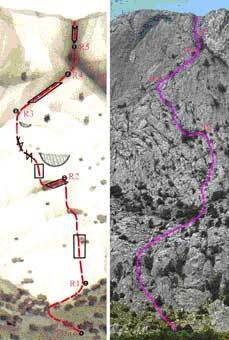 On the section R4-R5 – go upwards and to the right by easy rocks to the base of the vertical corner ( R4 - R5: 40 m, 60 0, II). On the last section of the route go upwards by the vertical corner till the summit (R5 - peak: 40 m, 85 0, IV+). 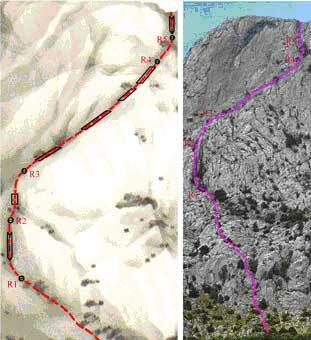 Length of the main part of the route is 310 m.
The ascent takes 4 - 5 hours.